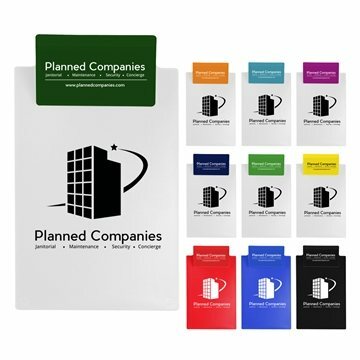 This little clipboard with a 4" clip is perfect for meetings and tradeshows. It can be printed on clip, front and back for maximum advertising impact. Holds a standard 5 1/2" x 8 1/2" notepad. Loved the final product and was exactly what we were expecting. It was great that the price fit our budget. thank you to Alicia for her assistance. the members who received the hats were very pleased. there were no hidden agendas and I was incredibly pleased with Alicia's knowledge and execution of our order. My client were ecstatic with the quality of this item. Everything was done quickly, it was a last minute order and everything came out very well. Next years conference holders are already asking us where we bought the product. we will continue to refer you over and over and over again!